Liverpool has a thriving creative scene, fuelled by its universities, businesses and long musical and artistic heritage. As London continues to price its young and vibrant creative communities out, the north is becoming increasingly attractive among graduates, creative industries and former Londoners looking to relocate. Building on its creative past Liverpool has an ever-expanding creative and tech community. It's home to over 7,000 creative and digital companies and one of the focal points for the European games industry. An expanding wealth of creative talent is often followed or accompanied by coffee. The fuel to provide inspiration, creative thought and excited button pushing. Over the years it's been a friend to Beethoven, Bach and Balzac (who apparently drank 50 cups a day), enlivening the creative synapsis and promoting artistic flair. If you're looking for creative hangout there are a number of amazing cafés throughout Liverpool. The perfect meeting spaces or simply a creative sanctuary for those in need of Wi-Fi and a few vats of coffee. 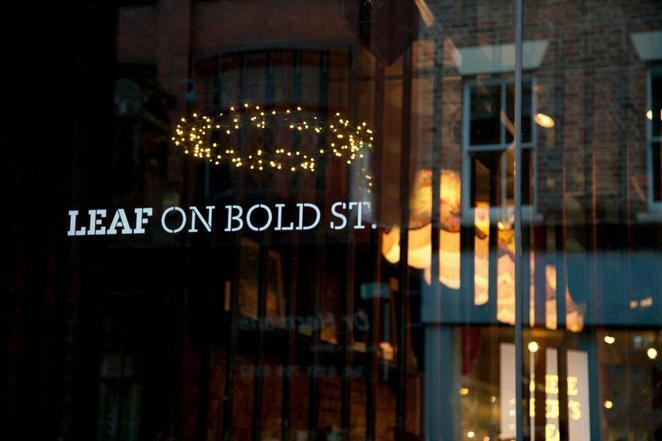 Leaf is a beautifully distinctive teashop and bar on Bold Street. Without the quaint cosiness that usually springs to mind at the word "teashop", it instead has the advantage of being set in a distinguished and huge art deco building. It's spread over two floors and very consciously a creative space, hosting vintage markets, exhibitions, bands and club nights. The owners clearly want to create something of an artistic community with a variety of interesting people, stating on their website that they "work closely with foodies, creatives, academics and musos to develop an events programme to appeal to like-minded individuals". Given the evident popularity of the place it appears that they have been successful in this. On the food front, Leaf has a varied menu, from breakfast through to dinner and everything in-between that focuses on fresh simplicity. Stews, burgers, and classic brunches like sandwiches and eggs benedict seem to dominate, which is reassuring as nothing much can go wrong and the prices reflect the unfussiness. They also serve halloumi in their vegetarian breakfast. Any place that gives you fried cheese first thing in the morning is a winner in my book. They also of course have an astonishing array of teas that will satisfy anyone, and it would take a true (and pedantic) expert find anything they've missed. The coffee is sourced from the Liverpool and Manchester coffee supplier Joe Black Coffee, and if your day has been particularly bad and you need something stronger there is, of course, the bar. Run by the brains behind Leaf, The Garden at FACT was all the "UKs leading media arts centre" needed to complete it, housing as it did 4 cinema screens, a bar and 3 galleries. FACT is a favourite in Liverpool for showing art house and mainstream films in a truly lovely and comfortable setting, even having one screen in a small room full of sofas, as well as hosting exhibitions and spearheading creative projects in the area. The Garden reflects this welcoming and creative atmosphere with an airy, leafy space that includes free Wi-Fi and power sockets. The Garden has a vegetarian focus (which makes sense, given the name) and generally supports a very pleasant and calming atmosphere, which may be best when you are on a deadline and having a personal meltdown. And once your work is done, you can go see a film in the same building! Perfect. For hard up students in Liverpool, and for arguably even more hard up graduates, Egg Café is a god send. Located at the top of a few flights of stairs in an old Victorian warehouse just off Bold Street, it's a vegetarian, laid back restaurant that doubles as a gallery. The venue itself is warm, bohemian and slightly eccentric, with trailing vines painted over the purple beams, but the real draw is the food. With no meal over six pounds, Egg Café offers a small menu and generous portions. Order cheese on toast and you'll get doorstop bread (with the option of making it deliciously garlicy), and a huge, varied salad. In most restaurants you'd pay £4 for the salad alone, which is delicious and so filing you are convinced it can't be good for you, but here it's a side. The liberal portions, good quality, and low prices make Egg Café really irresistible for anyone in need of a comforting meal and atmosphere in the week before payday, and considering the support it provided to me on many rainy university days, I'm half convinced it's run by saints. Absolutely one of Liverpool's most beautiful buildings, The Bluecoat is a Liverpool institution and, as it declares itself, a creative hub. A good place to wander round when you are in need of inspiration (even the shop looks like a gallery, filled with beautiful things), it also has two places to head to when you need recharging. Espresso is where you go for cake and coffee, with the option of drinking it in The Bluecoat's lovely garden. Upstairs is for when you want to take more time, as is evident in the fact there's sofas everywhere. It wouldn't be polite to lie down on one and put your feet up but it certainly invites that sort of behaviour. They serve locally sourced food and (perhaps more importantly) wine. Located, naturally, on Bold Street, Bold Street Coffee has been featured in The Independent's top fifty coffee shops and is stylish, laid back, and aim at true coffee lovers. Supplied with fresh ground coffee (like Leaf) from Joe Black Coffee it's often cited as Liverpool's best coffee shop. It has a small menu with all the essentials (bacon buttys are considered an essential, aren't they? ), supplemented by weekend and lunchtime specials. Independently owned, Bold Street Coffee also runs an art blog featuring the illustrations and artwork they hang on their walls, predominately by local creatives. They also interview these creatives, and do a great deal to promote the work of those who exhibit in their space. All these places add to the atmosphere of creativity and originality that permeates Liverpool, and do their own bit to support the artists, writers and the tech community that live there, whether it's just by providing them with much needed affordable food or by giving them a platform on which to promote themselves. I love all these places! Liverpool really does have some amazing cafes.